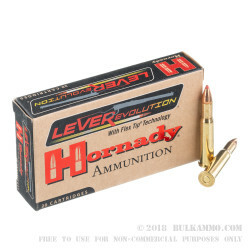 Although it reads like a mispronunciation of America's founding activity, Hornady's Leverevolution bullet is a projectile specially designed for performance in lever action rifles. Its polymer tip is safe to use in tubular magazines without risk of internal detonation, and its ballistic coefficient will impress even the most experienced .30-30 users. The Flex Tip Technology used in Leverevolution projectiles combines the accuracy provided by a pointed round, while delivering 40% more terminal energy than flat-nose bullets. Hornady's .30-30 Leverevloution's projectile weighs in at 160 grains and produces 2,046 foot pounds of energy at the barrel. It travels at 2,400 feet per second, and its boxer-primed brass is safe for reuse. It comes packaged in a 20-round plastic tray wrapped in a Hornady Leverevolution branded cardstock box. 4pt. 136 lbs. 125 yards. 30-30 160 gr. Peep sight, 1 shot, 1 kill. Excellent ammo! Bought a 1957 Winchester Model 94 .30-30 last year. Just got around to shooting it. Iron sights only but at 100yds Hornady Leverevolution rounds can mess up a bowling pin. Looking forward to deer hunting with this ammo this fall in PA. Hornady has hit a home run with this round. This stuff is just amazing in my Marlin 336. I zeroed my scope for 100 yards with 150gr CoreLokt, and these shoot 2" high, just like the box says. They give me another 75 yards of range before I have to start compensating. I haven't used them for hunting, so I can't comment on their knock-down power, but they're accurate, consistent, and always go BANG! when I pull the trigger. 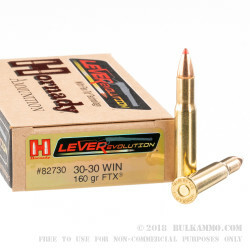 I just don't expect to find any Hornady Leverevolution rounds at a bargain price. What I do expect is to get maximum performance out of the old lever gun. This stuff delivers. The word must be out ... it is getting hard to find at something close to affordable. I use Hornady in my old .44 Mag lever gun also and it is impressive. A: With muzzle velocities of 2400fps, both 160gr FTX and 170gr RN will be 2 inches high at 100 yards. But the FTX will be traveling 160fps faster and has about 160ft-lbs more energy. At 200 yards, the FTX is 2" low, while the 170 is 3.5" low. Velocities are 1900 and 1600 fps, respectively. Energy, 1308 ft-lbs versus 982 ft-lbs. By 300 yards, the FTX has dropped 16 inches, while the 170gr RN has dropped 23. Velocities are 1702fps and 1311 fps, energy 1029 for the FTX and 648 for the 170gr RN. In other words, the FTX has more velocity and energy at 300 yards than the 170gr RN does at 200 yards. Hope this helps. Q: Hi there, I have a question about this type of bullet in tubular magazines, I am a future expat, and I'm looking at buying a nice 30-30 marlin lever gun to take with me to Argentina as a good survival / hunting rifle, and I know there have been issues with pointed bullets hitting the primer of the cartridge in front in tubular magazine that cause them to ignite and go off in the magazine. Is there something i can do to guard against this happening in my lever guns ? Are these safe to use because of the new innovative " flex " tip ? Thanks, - Henry . A: Yes, these Hornady FTX projectiles are safe to use in a lever action rifle. It is doubtful that you would find any factory-produced .30-30 that was unsafe for use in a tubular magazine. While this is certainly something to be aware of and avoid, it is doubtful that this has happened - unless someone handloaded ammunition with pointed bullets and then loaded them into a tubular magazine. Q: Is the OAL of the Leverevelution cartridges any longer than that of a traditional cartridges? A: The OAL of LeverEvolution cartridges is the same as standard cartridges, so they'll work in the same actions. The cases are slightly shorter to allow the FTX bullet to have a cannelure in the right location. If you reload these cases, be sure to use LeverEvolution bullets. Q: Not long after this ammo came out there was a recall. Do you know how they modified the rounds to avoid the problem they were having? 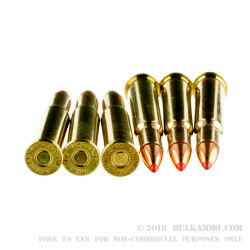 A: One lot of .30-30 Leverevolution ammo was underloaded and not to spec. That lot number is 3060134 and the ammunition was produced in 2006. All ammunition produced since then, including what we have in stock, has been made to the proper velocity specifications. Q: Is the Hornady better quality than Federal? What are the benefits of purchasing better quality past for example some of the cheaper being dirtier? A: Both Hornady and Federal are high quality ammo manufacturers. You might find that the Hornady ammo is slightly more accurate. Neither one would be considered "dirty." Q: Are these rounds California Condor corridor compliant? A: No, this is not lead free ammunition. Look for ammunition loaded with the Barnes TSX or TTSX bullets/projectiles.